Mammals are distributed in virtually every part of the globe. The only extensive areas of land from which they are absent are the Antarctic ice caps. Even in the Antarctic, seals occur on the coastal ice and may haul out on shore. A few species live at high Arctic latitudes; polar bears (Ursus mar-itimus) have been recorded as far as 88°N and ring seals (Phoca hispida) have reached the vicinity of the North Pole. Mammals are found on all the remaining continents, on all except the most remote islands, and in all of Earth's oceans and seas. Marine mammals are known to reach depths of 3,280 ft (1,000 m) while land mammals are found from below sea level to elevations above 21,500 ft (6,500 m). They are distributed in all biomes, including tundra, deserts, grasslands, and forests. Species in a wide range of families have adapted to an aquatic lifestyle in swamps, lakes, and rivers. Their distribution extends below the surface of the earth in the case of fossorial or burrowing mammals, and above it through adoption of an arboreal mode of life or by means of flight, in the case of bats. This essay focuses on modern zoogeography (animal distribution) and human effects on zoogeography in modern and historical times. Mammals are classified into 26 orders, 136 families, and more than 1,150 genera. The number of living and recently extinct species exceeds 4,800. This figure fluctuates as new species are discovered and the status of certain forms is revised. Advances in techniques of molecular genetic analysis have enabled taxonomists to assign taxa with increasing certainty to either specific or subspecific status. During the 1990s intensive fieldwork in forested mountains along the border between Laos and Vietnam revealed the existence of several new large mammals. These consist of a new species and genus of bovid, the saola (Pseudoryx nghetinhensis), and three species of muntjac, a type of small deer. These also included a new genus, Megamuntiacus. Fewer than 100 mammal species are either known or believed to have become extinct during the last 500 years. Some of these extinct species remain virtually unknown. For example the red gazelle (Gazella rufma) of North Africa is known only from three specimens obtained in Algeria toward the end of the nineteenth century; no living specimen has ever been described, and nothing is known of its ecology. Even more vague is the Jamaican monkey (Xenothrix mcgregori), which is known only from a sub-fossil jaw bone. The order Tubulidentata contains only one species, the aardvark (Orycteropus afer), which is restricted to Africa. The Monotremata (monotremes) and four orders of marsupials are confined to the Australian region. Two orders of marsupials are found only in a relatively small area of South America. The two largest orders are Rodentia (rodents), with over 2,000 species and Chiroptera (bats), with almost 1,000. Both of these occur naturally on all continents except Antarctica, and they are the only orders to have reached many oceanic islands. Ar-tiodactyla (even-toed ungulates) and Carnivora occur on all continents except Antarctica and Australia, though representatives of both have been introduced to Australia. The Cetacea (whales and dolphins) and Pinnipedia (seals and sea lions) have a worldwide distribution. Similar wide variations exist at family and species level. No mammal species is truly cosmopolitan, that is, it occurs in every region and every habitat, though a few species have an extensive distribution covering several continents. The gray wolf (Canis lupus) has one of the widest distributions of any terrestrial mammal and is found across North America, Europe, the Middle East, central and northern Asia, and India. The common leopard (Panthera pardus) also has an extensive range through Africa, Arabia, Turkey, the Caucasus and much of Asia, north to the Russian Far East. In the New World, the mountain lion or cougar (Puma concolor) is distributed from Canada to southern Chile. At the other extreme, some species have a distribution that encompasses only a few square miles. attained a large size, as did other Eurasian immigrants such as the mammoth and moose. The diversity and richness of the mammal fauna present at any one locality is also subject to great variation. Some places contain representatives of a few orders or groups and have only a few species in total while others have an abundance of species from across a wide range of groups. The reasons for these differences are a complex combination of evolutionary history, degree of isolation, primary productivity, and habitat complexity. 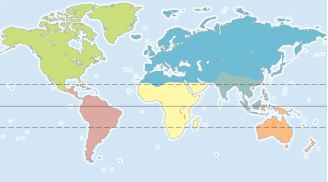 A latitudinal gradient is a general pattern, with the number of species increasing from the poles towards the tropics. A similar altitudinal gradient is also commonly observed, with the number of mammal species declining with increasing elevation, though in neither of these cases is the correlation uniform. There is also a generally positive correlation between species diversity and habitat complexity. 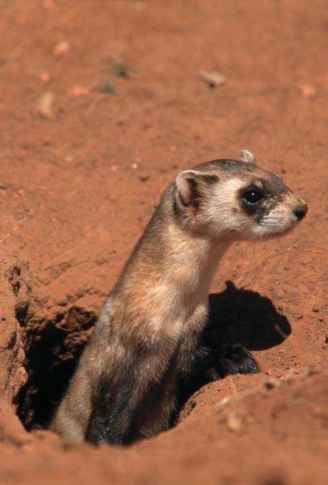 Smaller islands tend to have impoverished mammal faunas, which is partly a function of the species-area relationship by which smaller areas tend to contain fewer species of all groups. Ancestral forms of mammals evolved at a time when the continents were still connected in the single land mass of Pan-gaea. This split into two large continents, Laurasia in the Northern Hemisphere and Gondwana in the Southern Hemi sphere. Mammals continued to evolve as these then slowly separated into a series of plates that drifted apart to form the present continents. When plates remained isolated for long periods of geological history as in the case of Madagascar, Australia, and South America, unique mammal faunas evolved that were very different from those elsewhere. In other cases, plates gradually collided or were connected intermittently when lower sea levels exposed land connections, allowing mammals to mingle and disperse. Fluctuations in sea levels alternately exposed and flooded land bridges between regions, thus permitting and preventing dispersal of mammal groups between the two areas at different times. On occasions, a chain of islands formed, rather than a full land bridge, allowing some species to cross, but preventing others from doing so. The result of these movements is that each region has a mammal fauna composed of elements that originated there and others that arrived subsequently and at different times from somewhere else. Dispersing species interact with the existing fauna and may replace or modify the existing species. years ago until domesticated varieties were brought back by the Spanish conquistadors in the early part of the fifteenth century. Tapirs also evolved in North America and dispersed southwards into Central and South America and northwards into Asia. They subsequently became extinct in North America, leaving the current discontinuous distribution, with three species in Central and South America and one in Southeast Asia. Offshore islands can be reached by swimming mammals, and a chain of islands allows species to reach the farthest islands on the stepping-stone principle, moving from one island to another. However, the farther away an island is from the nearest mainland, the fewer the number of species that succeed in reaching them. Bats can fly to them and small mammals may arrive by chance, carried there on logs or rafts of floating vegetation. 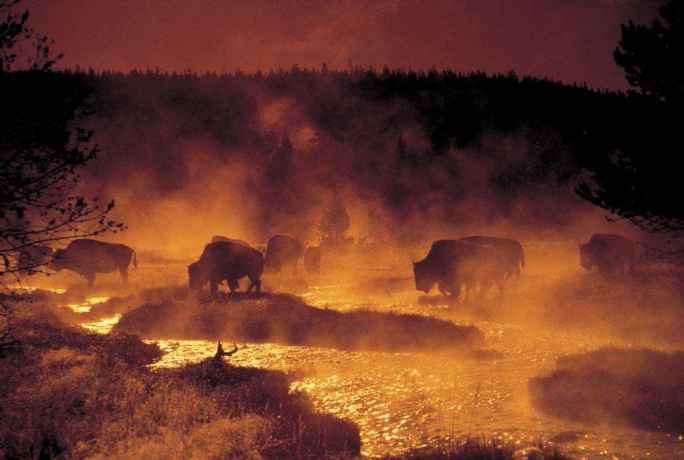 There are many other barriers to dispersal, such as large rivers, mountain ranges, deserts or other unsuitable habitat, the presence of predators, or competing species. Any factor or combination of factors that cause isolation may lead to further speciation (formation of new species). Variations in climatic conditions during the Pleistocene, especially the more than 20 major glaciations that occurred in the Northern Hemisphere, have also had a significant effect on the distribution of species. Conditions during the Pleistocene also affected marine environments. For example, cold Arctic and Antarctic waters, rich in dissolved CO2 and O2, together with upswellings of mineral-rich deep ocean currents generated tremendous plantation productivity, providing a foundation for the evolution of baleen whale diversity.